Dr. Landman is Chairman of the Department of Urology and Professor of Urology and Radiology at the University of California, Irvine School of Medicine. He is also the founder and director of the UC Irvine Ablative Oncology Center where he performs many of his minimally invasive kidney cancer procedures. Dr. Landman was previously a full-time faculty member of the New York Presbyterian Hospital and Director of the Columbia University Minimally Invasive Urologic Oncology Fellowship. Dr. Landman has extensive clinical expertise in laparoscopic renal and prostate surgery and endoscopic management of urinary tract pathology. His clinical interests include all aspects of minimally invasive urologic oncology with special emphasis on kidney cancer and prostate cancer. He has performed over 3000 advanced minimally invasive kidney procedures. He as pioneered technology and techniques for minimally invasive management of renal malignancies and has developed novel techniques that are used globally for laparoscopic partial nephrectomy. Dr. Landman is an internationally recognized expert and has been a visiting professor, lecturer, and given live surgical demonstrations around the world. Dr. Clayman is world renowned for his expertise in minimally invasive surgery for kidney stone disease, kidney cancer, and strictures of the ureter, and is listed among the Best Doctors in America for urology. Following his general surgery and urology training at the University of Minnesota, Dr. Clayman spent two years at Southwestern Medical School in Dallas pursuing his interests in renal cancer research, kidney stone disease, and minimally invasive urology. Dr. Clayman spent 17 years at Washington University School of Medicine in St. Louis, rising to become a professor of urology and radiology, director of the Midwest Stone Institute, and co-director of the Division of Minimally Invasive Surgery. In 1990, Dr. Clayman and his associates performed the world’s first laparoscopic removal of a kidney for a tumor. He established the nation’s first fellowship program in minimally invasive urology, and trainees of his program now occupy academic positions at university throughout the United States, Canada, and Israel. 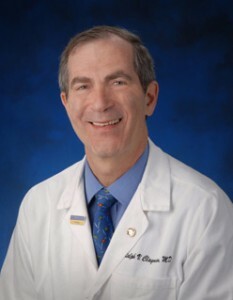 In 2002, Dr. Clayman joined UC Irvine’s School of Medicine as the founding chair of the Department of Urology and served as Dean of the School of Medicine from 2009 – 2014. He is the author of several textbooks on laparoscopic and percutaneous urologic surgery, and he has published more than 400 peer-reviewed papers and book chapters. He is co-founder and co-editor of the Journal of Endourology and has 14 minimally invasive surgical instrumentation patents to his name. He has received numerous national and international awards in urology. Dr. Ahlering is Vice-Chairman of the Department of Urology and Professor of Urology at the University of California, Irvine. He was formerly Chief of the Division of Urology from 1992 – 2002. He completed his residency in urology and his fellowship training in urologic oncology at the University of Southern California. He has pioneered innovations to the Indiana pouch and ileal neo-bladder reconstructions. 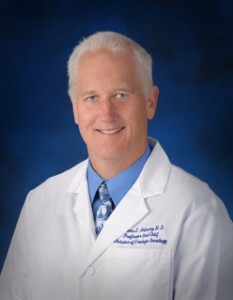 Dr. Ahlering has received local, national, and international recognition for his expertise in urologic oncology. His research focuses on the invasion and metastasis of prostate cancer and development of minimally invasive radical prostectomy assisted by the da Vinci Surgical System. He has performed more than 700 robotic surgeries, including the first robotic prostatectomies in Denmark, Canada, and Australia. Dr. Ahlering is actively involved in research projects in prostate and bladder cancer, and has produced several publications and book chapters. 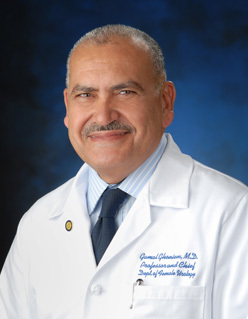 Dr. Ghoniem is Professor of Urology at the University of California, Irvine. He is fellowship-trained in neurourology and female urology. 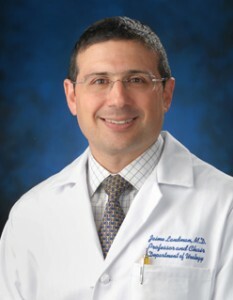 Dr. Ghoniem was previously a full-time faculty member at the Cleveland Clinic. He has served as a consultant of the surgical treatment group of the International Consultation on Urinary Incontinence. Dr. Ghoniem has also been appointed by the NIH as the chairman for a review panel on incontinence. He has been a member of the SUFU executive committee and has served a three year term as chairman of the Research and Development Committee of the international Urogynecological Association (IUGA). Dr. Ghoniem has edited two books on female pelvic pathologies in addition to writing multiple book chapters and publications. 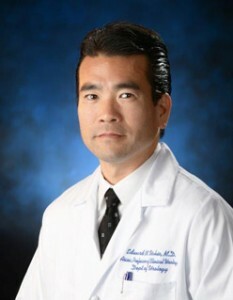 His clinical interests include female urology, pelvic reconstructive surgery, and voiding dysfunction. Dr. Uchio is a nationally recognized leader in the management of genitourinary malignancies. He completed fellowship in urologic oncology at the National Cancer Institute in Bethesda, Maryland. He has vast expertise in all areas of urologic oncology including advanced surgical treatment of prostate, renal, testis, and bladder cancers. He also actively uses laparoscopic, robotic, and minimally invasive techniques in addition to novel technologies only available in clinical trials. Dr. Uchio has presented internationally on the molecular basis of renal malignancies and is the author of numerous publications and book chapters on urologic cancers. He has also received numerous research grants and NIH funding for many of his oncologic research projects.